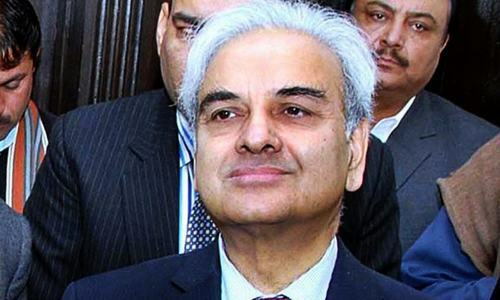 Retired Justice Nasirul Mulk took oath as the seventh caretaker prime minister at a ceremony held at President House in Islamabad on Friday, hours after the National Assembly was formally dissolved in the lead up to the elections. 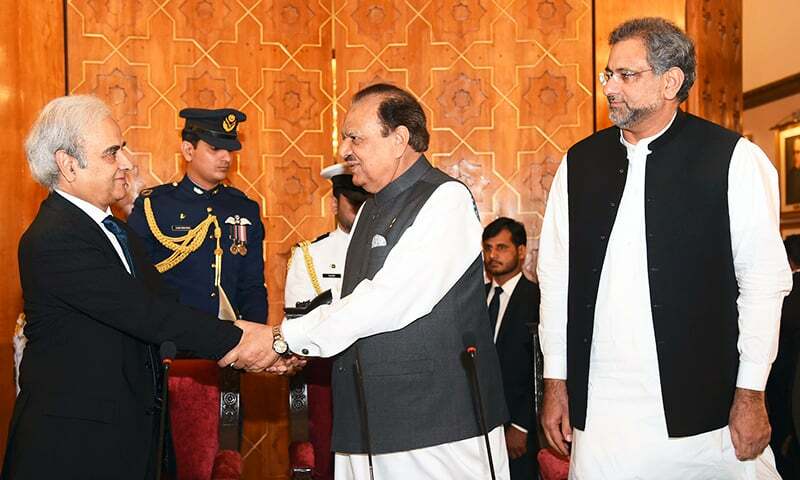 President Mamnoon Hussain administered the oath to Mulk, who was unanimously nominated for the post by both the government and opposition, with former PM Shahid Khaqan Abbasi describing the retired judge as a someone whom "no one could object to". Read more: The caretaker government: Why do we have one and what purpose does it fulfil? Following the ceremony, PM Nasirul Mulk received a guard of honour at PM House. 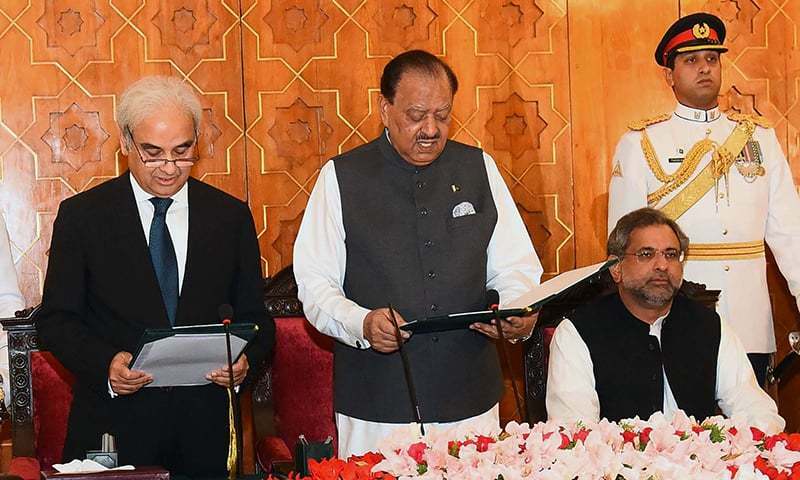 The newly appointed caretaker PM, while speaking to journalists after the ceremony, said that members of the Cabinet would be announced after discussion on the matter, Geo News reported. He said he would like to keep the Cabinet small. One of his first decisions was to change his principal secretary, Fawad Hasan Fawad, and replace him with Sohail Amir. Fawad has been rotated to DG Civil Services, DawnNewsTV reported. Mulk also said he would make sure that the elections will be held in a timely and transparent manner. "We will fulfil the duty we were entrusted with," he promised. The oath-taking ceremony was held hours after the third consecutive National Assembly completed its five-year constitutional term. It was only the second National Assembly to do so under civilian rule, with the 2002 assembly operating and disbanding under military dictator Gen Pervez Musharraf. The three NAs elec­ted seven prime ministers in 16 years, indicating underlying weaknesses in the process, the institutions of the state and political parties in the country. Former PM Abbasi spent a busy last day in office yesterday attending the NA's farewell session, addressing a news conference highlighting his government’s achievements at his office and presiding over separate meetings of the Economic Coordination Committee and the Federal Cabinet. During his address to the Assembly, Abbasi categorically stated that the PML-N would not tolerate even a day's delay in the elections. He also reiterated his party’s demand of formation of a Truth and Reconciliation Commission to investigate all major political incidents which took place in the country since 1947 to identify those responsible for them. Editorial: Will the elections be held on time? His demand received a positive response immediately from Opposition Leader Syed Khursheed Shah, who expressed the hope that whoever formed the next government must do it on a priority basis. Congratulations PML-N, PPP and Pakistan. Welcome Honourable PM. PTI now enjoy. Let's hope the new caretaker PM will make decisions impartially without any pressure or favour for anyone! This is along with fair and free elections are expected during the next few months. 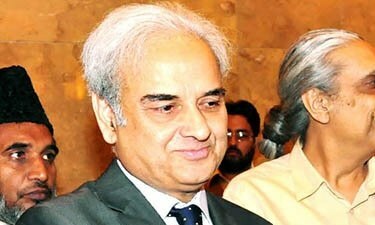 Good luck justice Nasirul Mulk! Congrats CPM Mulk. Wish you all the best. is there any difference between oath of elected PM and Interim PM? Congrats to new PM. Wishing him a success in conducting impartial & timely elections. I am so happy. I have seen Mamnoon Hussain after a long time. Welcome to the club of interim Prime Ministers. Keep it up and hang on tough. Hope he would meet the expectatiins of the nation. 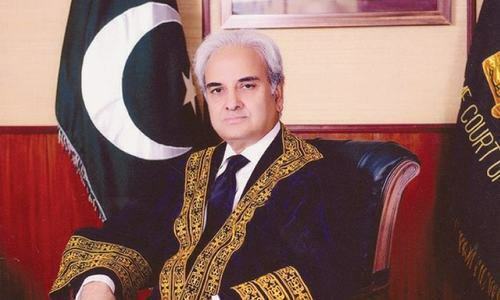 Let us hope and pray that the new caretaker PM will deliver his duty without any favor or fear and will earn a name and fame in the history of parliamentary elections in Pakistan by holding free, fair and transparent elections, so that the country could be run by able politicians to make Pakistan peaceful and prosperous. Congratulations Pakistan. The system moves forward. What Abbasi is doing here in Oath ceremony ? I can't understand futile exercise of caretaker setup. 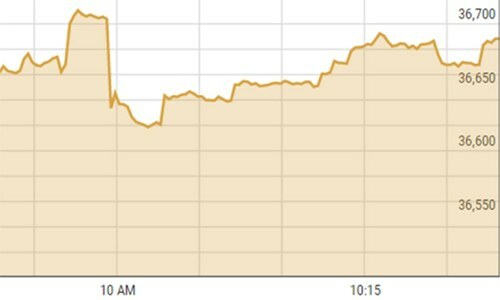 In India during election process Election commission takes control of affare and monitoring of government. Government can't announce soaps or make policy statement during election process. Even ruling party pays prime minister's Chief minister's and ministers traveling expenses. Congratulations on succesful democratic transition. Now let's make sure the coming elections are fair , free and without violence. No one should die. Good work PPP and PML-N!